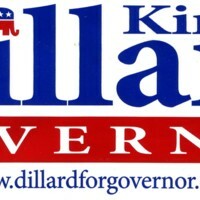 Campaign bumper sticker from the unsuccessful 2014 gubernatorial candidacy of Kirk W. Dillard, Republican; a classic election color scheme of white, red and blue theme is used, with a union label appearing in the lower dexter corner, and reference to Dillard's campaign website appears prominently beneath his name and declaration. The Republican elephant logo replaces the dot above the lowercase letter ‘i’ in his surname. Dillard was defeated 40%-37% by Bruce Rauner, who went on to win in the final polls. This was Dillard’s second attempt for the Republican candidacy for Illinois Governor. The first, in 2010, pitted Dillard against six other Republican contenders; Dillard, however, lost to Bill Brady by a slim 193 votes. The cost of sticker production for the 2014 campaign was borne by the “Dillard for Governor” Committee; Union Local 820 did the printing. Contributor Mary Hudgins is a former legislative intern. A graduate of Sangamon State University (now University of Illinois at Springfield) in Political Science, she is originally from Naperville. She believes that the election items in her personal collection are rare, and wants to insure their preservation through digitization in the 2016 UIS History Harvest project. Dillard for Governor Committee, “Bumper Sticker, “Dillard for Governor”, Kirk Dillard, Republican Primary Candidate for Illinois Governor, 2014,” UIS History Harvest, accessed April 20, 2019, http://uishistharv1.uis.edu/items/show/192.